Some of the RIT students recognized during the 2016 RIT Leadership Awards. 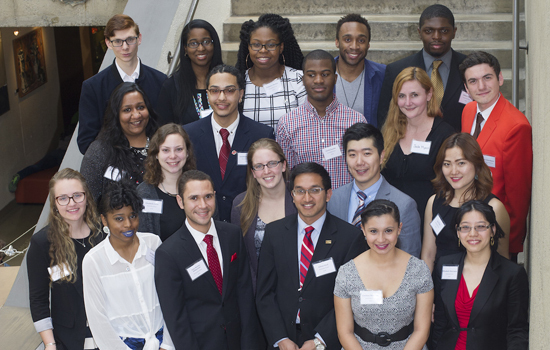 Twenty-five Rochester Institute of Technology students Wednesday received 2016 Leadership Awards and scholarships. The awards are given to nominated students who possess high leadership qualities, help advance college life on campus or in the community, help to build bridges for their peers and, in some cases, overcome personal hardships. Nicholas Giordano, RIT Student Government president and one of the award winners, said many of the recipients have served in influential roles as experienced leaders in various organizations. “The accomplishments you all have had here at RIT define a commitment to your organizations and a passion to succeed, and it is those like you that make your clubs and organizations continually better,” he said. Giordano stressed that the best leaders are the ones who foster the growth and development of future leaders once they have graduated. “Without a focus on helping those who will lead after us, the work we have done will have been for naught,” he said. Wilson Darko, an electrical engineering technology major from Bronx, N.Y.
Jade Myers, a professional studies major from Canandaigua, N.Y.
Elizabeth MacLaren, an ASL-English interpretation major from Noblesville, Ind. Jose Batista Abikarram, an industrial and systems engineering major from the Dominican Republic. Srikripa Kartik, a sustainable engineering major from India. Elizabeth Grese, an international hospitality and service management major from Liberty, N.Y.
Ja’Nai Gray, a criminal justice and sociology major from Rochester, N.Y.
Kelsey Kiefer, an environmental health and safety management major from Old Forge, N.Y.
Laura Alderfer, a biomedical engineering major from Sellersville, Pa.
Leah Bockhahn, an environmental sustainability major from East Concord, N.Y.
Aye Chan, an accounting major from Rochester, N.Y.
Chantel Charlebois, a biomedical engineering major from Jericho, Vt.
Patience Ibezim, a physician assistant major from Rochester. N.Y.
Vincent Lin, an industrial design major from Chili, N.Y.
Trevor McClenon, a civil engineering technology major from Walton, N.Y.
Austin Quinlan, a film and animation major from Marcellus, N.Y.
Jonathan Roman, an ASL-English interpretation major from Rochester, N.Y.
Adnan Syed, an accounting major from Endicott, N.Y.
Anna Valentine, a packaging science major from Pittsford, N.Y.
Nicholas Giordano, a management information systems major from Greece, N.Y.
Eric Senna Award: Andrea Shaver, a graphic design major from Frisco, Texas. Bulls, Moore, Willoughby Memorial Scholarship: Adnan Syed, an accounting major from Endicott, N.Y.
First place: Casira Copes, an advertising and public relations major from Elkton, Md. Second place: Corinne Mendieta, a mechanical engineering technology major from Brookeville, Md. Third place: Justin Namba, a computing and information technology major from Henrietta, N.Y.
Third place: Wilson Darko, an electrical engineering technology major from Bronx, N.Y.
H. Preston Herring Award: Samuel Echefu, computer engineering major from Bronx, N.Y.